Photo courtesy Photorama Eight members of the Galion High School class of 1944 and 12 guests celebrated their 73rd reunion Sept. 17 at Pizza Hut in Galion. In attendance were: seated: Virginia Kreps Barr, Carolyn Brooks Widener, Marjorie Staub Shaffer and Ruth Ricker Ritchey; standing: Kenneth Hayes, Jerry James, Emery Shaffer and Donald Shifley. The luncheon included viewing photos of former reunions and a lot of catching up. Each classmate received an 8x10 photo of the classsmates and another photo of the whole group. The photos were taken before the luncheon by Photorama Studio. 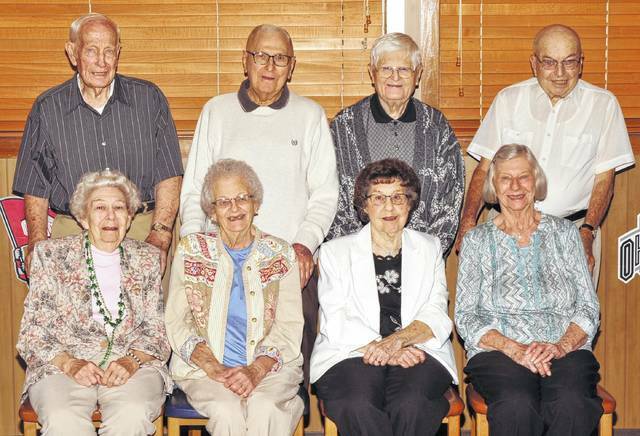 Eight members of the Galion High School class of 1944 and 12 guests celebrated their 73rd reunion Sept. 17 at Pizza Hut in Galion. In attendance were: seated: Virginia Kreps Barr, Carolyn Brooks Widener, Marjorie Staub Shaffer and Ruth Ricker Ritchey; standing: Kenneth Hayes, Jerry James, Emery Shaffer and Donald Shifley. The luncheon included viewing photos of former reunions and a lot of catching up. Each classmate received an 8×10 photo of the classsmates and another photo of the whole group. The photos were taken before the luncheon by Photorama Studio. Photo courtesy Photorama Eight members of the Galion High School class of 1944 and 12 guests celebrated their 73rd reunion Sept. 17 at Pizza Hut in Galion. In attendance were: seated: Virginia Kreps Barr, Carolyn Brooks Widener, Marjorie Staub Shaffer and Ruth Ricker Ritchey; standing: Kenneth Hayes, Jerry James, Emery Shaffer and Donald Shifley. The luncheon included viewing photos of former reunions and a lot of catching up. Each classmate received an 8×10 photo of the classsmates and another photo of the whole group. The photos were taken before the luncheon by Photorama Studio. https://www.galioninquirer.com/wp-content/uploads/sites/38/2017/10/web1_Class-of-1944-GHS-reunion.jpgPhoto courtesy Photorama Eight members of the Galion High School class of 1944 and 12 guests celebrated their 73rd reunion Sept. 17 at Pizza Hut in Galion. In attendance were: seated: Virginia Kreps Barr, Carolyn Brooks Widener, Marjorie Staub Shaffer and Ruth Ricker Ritchey; standing: Kenneth Hayes, Jerry James, Emery Shaffer and Donald Shifley. The luncheon included viewing photos of former reunions and a lot of catching up. Each classmate received an 8×10 photo of the classsmates and another photo of the whole group. The photos were taken before the luncheon by Photorama Studio.